Zeno of Elea was a pre-Socratic Greek philosopher of southern Italy. He was born about 490 BC and died about 430 BC: the exact dates are not known. Zeno a member of the Eleatic School founded by Parmenides. Aristotle called him the inventor of dialectic. He is best known for his paradoxes, which Bertrand Russell has described as "immeasurably subtle and profound". Although many ancient writers refer to the writings of Zeno, none of his writings survive intact. 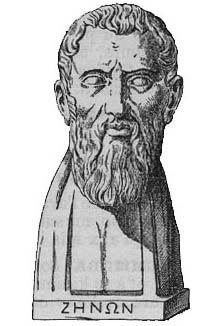 According to Proclus in his Commentary on Plato's Parmenides, Zeno produced "not less than forty arguments revealing contradictions",  but only nine are now known. Zeno's arguments are perhaps the first examples of a method of proof called reductio ad absurdum, literally meaning to reduce to the absurd. This destructive method of argument was used by him to such an extent that he became famous for it. ↑ Russell, p. 347: "In this capricious world nothing is more capricious than posthumous fame. One of the most notable victims of posterity's lack of judgement is the Eleatic Zeno. Having invented four arguments all immeasurably subtle and profound, the grossness of subsequent philosophers pronounced him to be a mere ingenious juggler, and his arguments to be one and all sophisms. After two thousand years of continual refutation, these sophisms were reinstated, and made the foundation of a mathematical renaissance..."
↑ Plato (370 BC). Parmenides, translated by Benjamin Jowett. Internet Classics Archive. ↑ Zeno in The Presocratics, Philip Wheelwright ed. 1966. The Odyssey Press. 106-107. This page was last changed on 21 April 2014, at 15:35.